It is quite possible that there were vines planted at Pellehaut in Roman times, as the Roman villa of Seviac is only 2 kms away and has mosaics featuring vines. Domaine de Pellehaut is situated at the highest point in the district of Montréal du Gers (180 Metres) and today covers 530 hectares of which 180 hectares are vines. 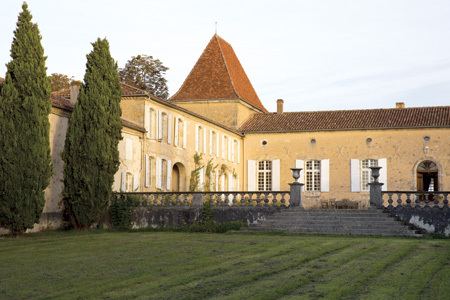 It is a true farming estate run in a traditional way by Gaston Béraut and his sons, Martin and Mathieu. At Pellehaut, 2 varieties are used in the production of eaux de vie. – The Ugni blanc, destined for Armagnacs which will be commercialised from 15 years of age. – The Folle blanche, the oldest variety in Armagnac, which gives finesse and complexity, and which can be drunk younger. The vinification of the wines destined for distillation consists of ageing on the lees with regular batonnage. After leaving the alambic after the “simple chauffe”, the eau de vie of the wine is placed in 400 litre oak barriques, some from the property itself, some from the Limousin forests. The last Folle blanche to be distilled is matured in 225cl Bordeaux barriques which had been used previously to age the best white wine cuvees. The reduction of the Armagnacs takes place step by step with the addition of water (a mix of distilled water and alcohol) prepared a long time in advance.